The thyroid is an endocrine gland located in the neck. It secretes hormones that are responsible for metabolic rate, protein synthesis, and the body’s sensitivities to other hormones. In this article, we shall look at how to perform an examination of the thyroid gland, and detect signs of thyroid disease. Fig 1 – Features of thyroid disease in the hands. 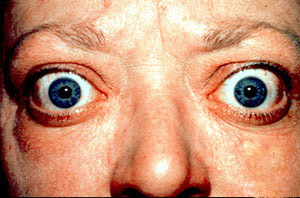 A) Thyroid acropachy – clubbing and swelling of the digits and toes. B) Onychyolysis – separation of the nail from the nail bed. Step behind the patient, tilt the patients head back slightly, and inspect for proptosis (unilateral or bilateral). Fig 2 – Proptosis and lid retraction in thyroid eye disease. Using the pads of your fingers, gently pass them over this area to palpate the isthmus and thyroid lobes. Fig 3 – Stand behind the patient to palpate the thyroid gland.